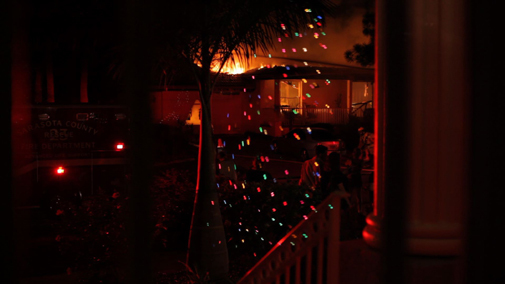 Fire | Dave Andrae's "Blog"
At the tail end of 2012 there was a raging housefire right across the street from the abode I presently call home near the Gulf of Mexico in Florida. Fortunately no people or animals died in the fire, but it was fairly scary, especially at first when it wasn’t clear whether anyone was inside and the fire trucks hadn’t arrived yet. I shot some video footage of the fire with my Canon 5D. And I’ve made a micro movie titled Fire in the Neighborhood consisting of one perceptually dense shot that lasts about a minute. I’d like to think that it harkens back to the early cinema of the Lumière Brothers in that it functions as a document of a real occurrence with no embellishment, though perhaps the Christmas tree lights reflected in the window and the flashing emergency lighting give it more of an expressionist quality. Normally, as of late, my shooting style tends to embrace pared-down imagery. With Fire in the Neighborhood, however, there’s quite a lot going on from a visual/compositional standpoint. For this reason, though the video is straight-forward, I think it rewards multiple viewings. And I’m happy to add it to my official oeuvre. My only regret is that the audio (the sound of our dog barking, alarmed and obviously aware that something out of the ordinary is going on) was recorded with the substandard in-camera microphone–my H4n and shotgun mic were tucked away and in the heat of the moment it didn’t occur to me to use them.